Card Text Play: Play the top card of your deck. You gain Æmber from any Æmber bonus on the played card. You resolve any “Play:” effects on the card played from the top of your deck. Its the first turn of the game and I am going first. I choose house Logos to be the active house and play the card Wild Wormhole. Can Wild Wormhole’s effect be resolved even though the First Turn Rule is in effect? Yes. The First Turn Rule specifies that players cannot play or discard more than one card from their hand, but it does not prohibit cards from being played or discarded from other game areas, such as your deck. Therefore, Wild Wormhole’s effect can be resolved on the first turn of a game. What happens if I play Wild Wormhole and my deck is empty? You can only shuffle your discard pile to reset your deck when you need to draw a card, not when you play one from the top of your deck. Therefore, if a deck is empty, a card cannot be played in this manner. However, you still get the Æmber bonus on the card. What happens if I play Wild Wormhole and the top card has a requirement to play (such as Truebaru or an upgrade) that I cannot fulfill? 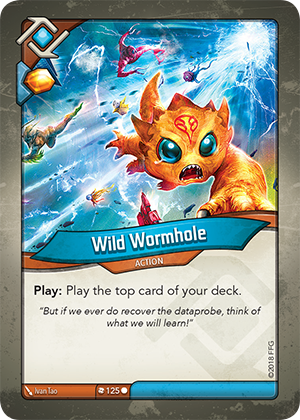 If a card played by Wild Wormhole has a requirement that cannot be fulfilled, the card is not played and returns to the top of the deck.